Deciding on what things to do in Mexico City can be overwhelming. Fortunately for you, I’ve teamed up with a group of travel blogger friends to bring you the best in Mexico City attractions. 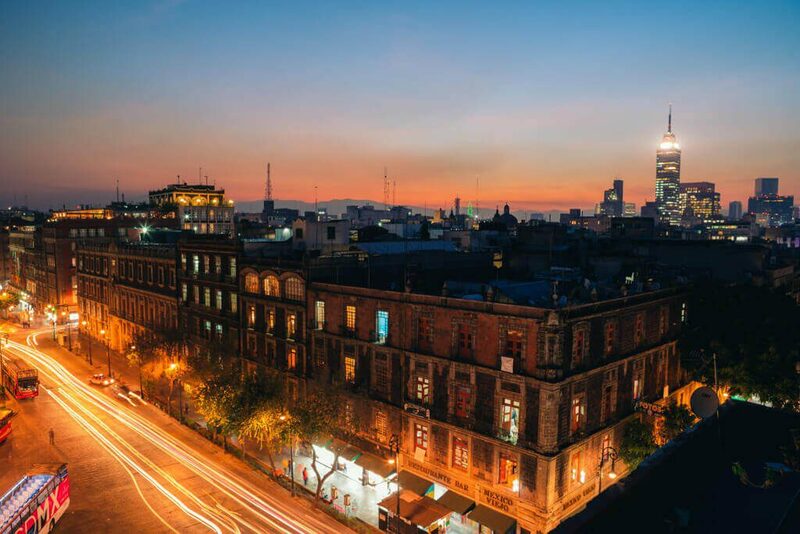 From cooking classes, to exotic markets, funky neighborhoods, museums and so much more — there’s something of interest for everyone visiting Mexico City! Looking for a taste of the old world? I’d recommend a visit to the extravagant Chapultepec Castle, the only royal castle in the Americas. Located at the highest point in beautiful Chapultepec Park. Located at the highest point of beautiful Chapultepec Park, this castle was built between 1785 – 1787 as a vacation residence for Viceroy Bernardo de Galvez. At one point, it served as the imperial residence for Emperor Maximilian and Empress Carlota. Now, the castle houses the National Museum of History. 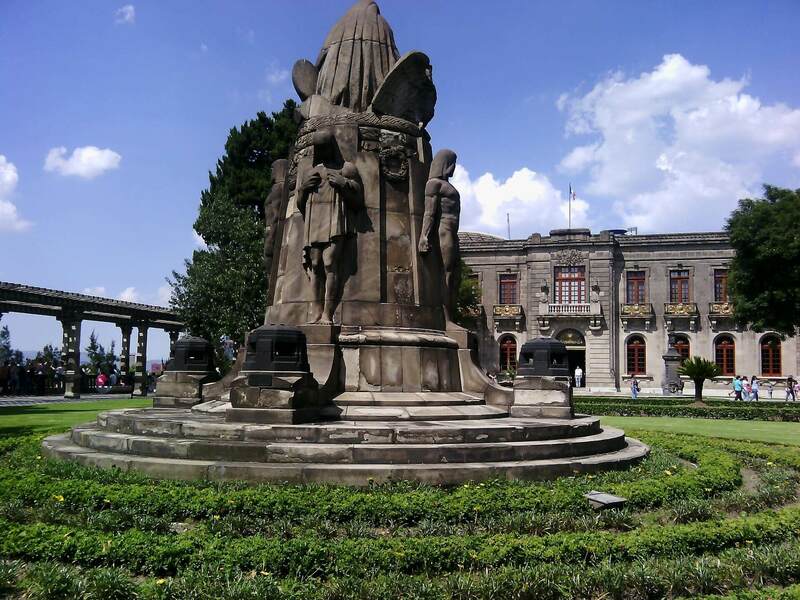 Derived from the Aztec Nahuatl language, the castle’s name, Chapultepec means Grasshopper Hill. The museum houses extraordinary murals by Jose Clemente Orozco, David Alfaro Siqueiros, and other world-renowned artists. Other must-sees include the carriages on the ground floor and the opulent furnishings and displays in the upstairs rooms. I’d also recommend you take a few minutes to enjoy panoramic views of Paseo de la Reforma from the Chapultepec Castle’s black and white tiled balcony. The museum is open Tuesday to Sunday from 9:00 to 5:00 (closed Mondays). To get there, take Metro Line 1 to Chapultepec Station and walk up the hill. 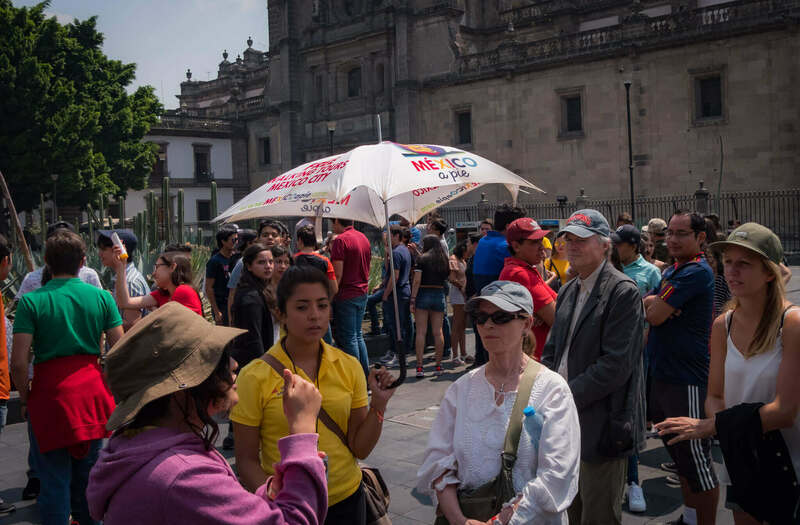 At nearly 9 million people, Mexico City is HUGE, and getting your bearings can be difficult. That’s why I always recommend a free walking tour. There are plenty of companies to choose from, but we went with Mexico a Pie — which means Mexico by foot. There were no pies, sadly…maybe an empanada. These guys speak amazing English and are friendly, knowledgeable and all-round expert guides to Mexico City. There are parts of the city that we wouldn’t have even known were there had we not taken this tour. We discovered ancient Aztec temple ruins right in the heart of the city and learned fascinating information about the sinking Mexico City Metropolitan Cathedral. In fact, because it was built on a swamp, all of Mexico City is sinking quite rapidly (for a city, at least). I was fascinated to see what officials are doing to combat this. You will learn all this and more on this tour, and as I said at the beginning — it’s absolutely free! Of course, the guides always appreciate tips, but they are honestly just people who are passionate about their city — and it shows. San Juan Market (Mercado de San Juan) is not your typical local Mexico City market. Where else could you find lion meat, deep-fried tarantulas, tiger meat, BBQ’d crocodile and all kinds of other exotic offerings. Sure you’ll find plenty of fruits and veggies, but not like any other market in Mexico City — or even in all of Mexico. Here, vendors specialize in unique offerings mostly imported from Asia and Europe. Because of its exotic ingredients, the market has become a go to for chefs, who you can find shopping alongside everyone else. The market also has many restaurants on site, ranging from sandwich shops to gourmet seafood stalls and even stands that will grill your selections of lion and tiger meat while you wait. While you can visit the market on your own, I suggest you take a tour with a company I enjoyed, Eat Mexico. They’ll tell you all about the market’s history and give you a much better understanding of what you should (and shouldn’t) try. My guide was an actual chef with a ton of knowledge about the market. After eating our way through Mercado de San Juan, we even went on to sample some authentic street food. To read my complete review of the Mercado de San Juan walking tour click here. Xochmilco is a must-do while visiting Mexico City! Located an hour south of the city center Xochimilco is a series of canals you can tour by boat. Most of what we know now as central Mexico City used to be a lake, so, in some ways, Xochimilco is a window back into the past. Locals and tourists alike know Xochimilco as one big party! Rent a boat for a couple of hours with your friends and family and ride through the beautiful canals as you snap photos, eat food, drink, and listen to music! Almost anything goes on Xochimilco. 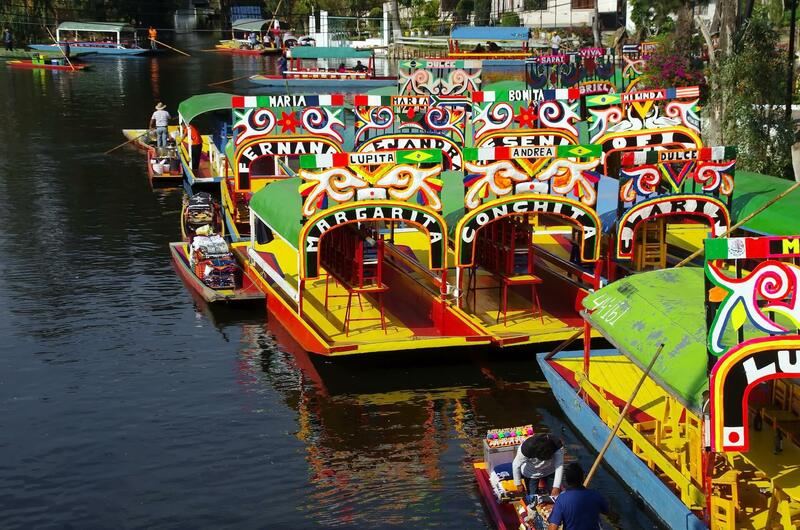 To tour Xochimilco, you’ll need to find and rent a boat (trajinera). Most recommend you take 2-4 hours to see the canals in their entirety, but we opted for 2 hours, and that was the perfect amount of time. There are plenty of signs advertising 500 pesos per hour, so make sure you pay that and not a penny more! There are a few places to stop along the way. We opted to simply take photos from the boat, but if you are keen to stop, just let your guide/captain know. One of the most popular photo stops is Doll Island, a creepy area with dolls hanging from the trees. The place is a rumored to be a tribute to a girl who drowned in the canals years ago. So, get your friends together, pack a cooler with all the beer, put together a kickass Reggaeton playlist, and head out for a super fun afternoon on Xochimilco! Don’t forget your Bluetooth speakers so you can dance, sing and party like the locals! Visiting the Casa Azul, officially known as the Frida Kahlo Museum, was a highlight of my time in Mexico City. I’d heard so much about Frida Kahlo and had seen some of her art, but I didn’t know much about her life. Even so, I was curious enough to hop on the Metro and tackle the walk from the station into the Coyoacan district, where the museum’s based. The museum’s first impressions were…impressive: the striking blue buildings will certainly catch your attention. As an artist famed for her use of color and expression, it’s no surprise Kahlo’s former residence is every bit as flamboyant as she was. While not too big, the museum is incredibly well curated. You’ll enjoy walking through the home Kahlo shared with her husband Diego Rivera until her death in 1952. You’ll find yourself peeking at the couple’s collection of folk art, jotting down Kahlo’s own mole recipe, and marveling at a few of Kahlo’s own paintings. Casa Azul is a must-see for anyone visiting Mexico City. One of the best things to do in Mexico City when in Zocalo is checking out the rooftop bars overlooking this historical city center. We highly recommend the view from Tereza Cathedral. Located in an unassuming hotel, you’ll enjoy this rooftop bar’s cool vibe, fully loaded bar, and cheap cervezas as you overlook the Metropolitan Cathedral and Avenida Madero all the way down to the Latin America Building. If you want a real moody scene, come for sunset. We lucked out with a gorgeous orange sunset that cemented this bar as one of the most memorable spots in the city for us and our friends. Teotihuacan is a city like no other: nicknamed the City of the Gods by the Aztecs, the city is home to pyramids that reach into the sky — and pyramids you can still climb today (if you’re willing to get a bit out of breath)! Perhaps the most fascinating thing about Teotihuacan is that, while the Aztecs named it, they definitely didn’t build it — the city predates the Aztecs by about a 1000 years. Who exactly built Teotihuacan is a mystery today, and standing in the city is a not-so-subtle reminder of how much history has been lost to time. Whether you visit the ruins with a group or on your own, Teotihuacan is an easy day trip from nearby Mexico City, and its one we heartily recommend. 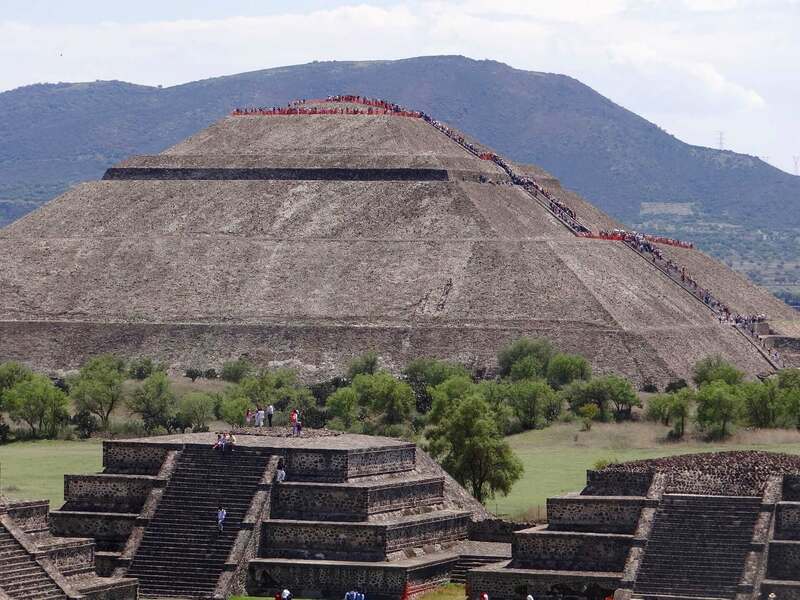 There is nothing quite like standing atop a pyramid and staring out over an ancient, mysterious city — and in Teotihuacan, you can experience it for yourself. When we visited Mexico City for a 4-day weekend awhile back, we really had no idea what we wanted to see. We just wanted something uniquely Mexican. 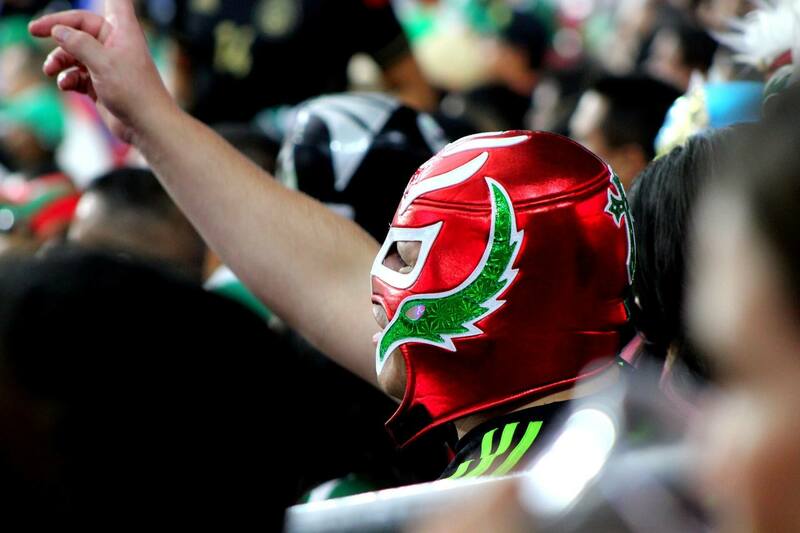 Fortunately, a friend we met there had something in mind — Lucha Libre. When he explained it to us, I had no real interest, and I only decided to go to be polite. My first thought was “WWE,” and I am decidedly not a fan! But I’m glad I went! Lucia libre is definitely “unique.” Men, women, and even little people take part. And their masks are designed insanely well. I learned later that they’re often based on Aztec art. As a newbie, you get the feeling that these guys can do whatever they want in the ring – anything – anonymously! Lucha libre has far more personality than the wrestling you see in America. 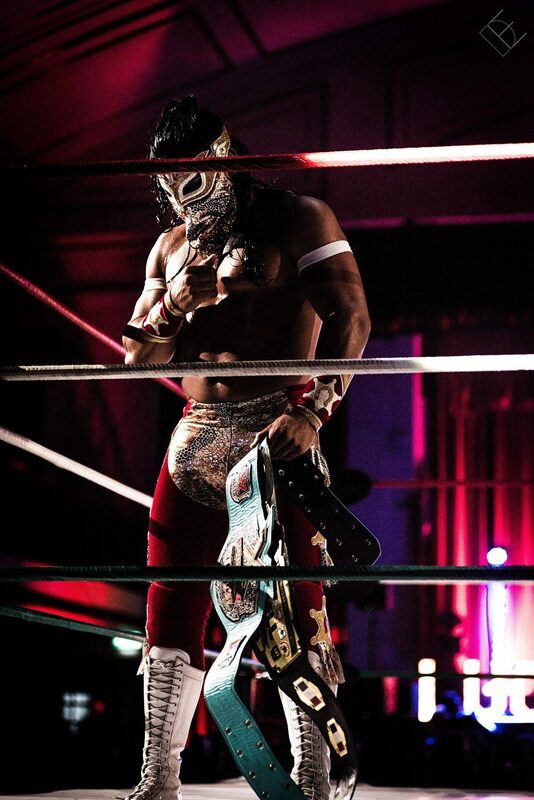 Wrestlers — or luchadores — often come from a long family line. And audience members identify and take a lot of pride in those lines. While lucha libre might not be on your original CDMX list, I encourage you to give it a shot. It’s a really fun night out with locals, and you get to participate in something that’s uniquely Mexican! Tequila and Mezcal aren’t the only alcoholic beverages exclusively made in Mexico. Pulque has actually been around much longer than either of them. And while you can buy tequila in most any country, you will not find fresh pulque anywhere outside of Mexico. This is because the drink requires an ongoing fermentation process and must be consumed within a few days of maturation, otherwise it spoils. This makes exporting the stuff very difficult. 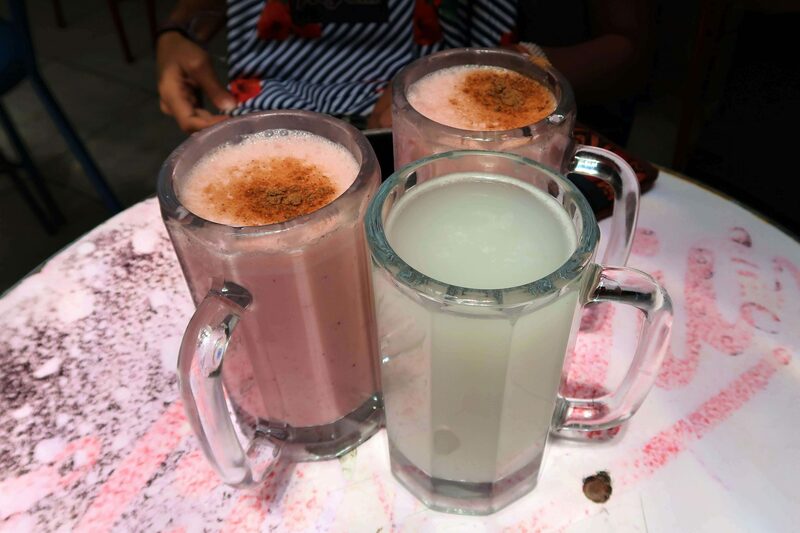 So what exactly is pulque? Put simply, it is fermented agave sap. Since it isn’t cooked down, it keeps a thick and slimy texture you might expect from cactus juice. The flavor is quite sour. Most pulquerias give you the option of drinking it plain (blanco) or sweetened with added fruit or nut mixtures (curado). 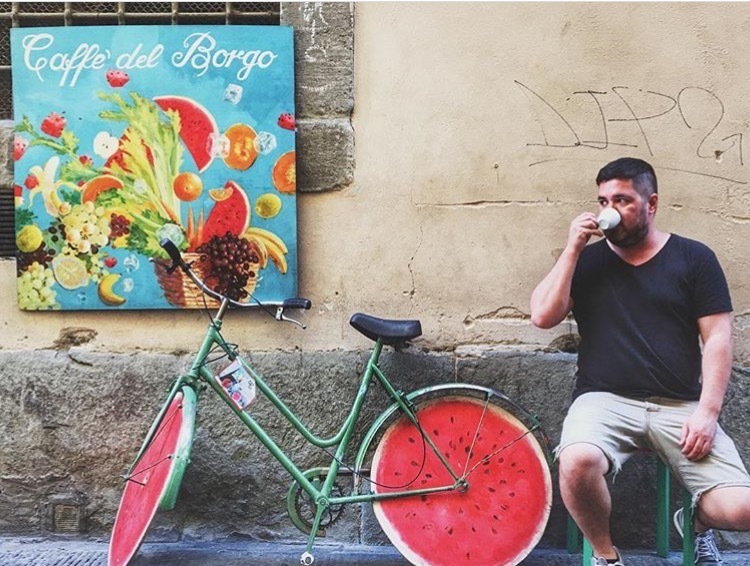 If you are looking for a truly Mexican experience that predates even Cortez and the Spanish, find a pulqueria in Mexico City and indulge in the “drink of the gods”. 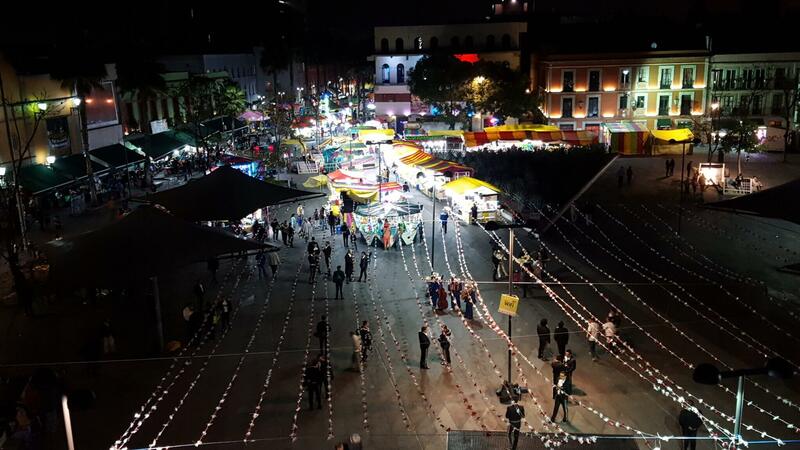 If you’re looking for an experience entirely unique to Mexico City, head out to Garibaldi square (or Plaza Garibaldi in Spanish) on your next visit. This large open square is lined with dozens of good Mexican restaurants and a slew of roving Mariachi players and wicked tequila bars — you’re in for a fun night. The action on Garibaldi tends to start later, when the bars and restaurants are hopping. If you’re in the mood for a quiet dinner, come earlier and stay for all the entertainment after. If you’re not sure about what food to order, don’t worry. Most places have English menus. You can even ask to take a look inside the kitchen to see what’s cooking on the stove. Check out more of Garibaldi square here for more pictures and fun things to do in the area. Garibaldi square is located in the historic downtown district, just a few blocks north of Palacio Bellas Artes. Learn How to Make Mexican Food Yourself! Food is a huge part of culture, especially in Mexico where, traditional Mexican cuisine has been awarded UNESCO status as a piece of Intangible Cultural Heritage of Humanity. One of the best ways to learn more about Mexican food while visiting Mexico City is to take a cooking class. Casa Jacaranda is a cookery school hosted within the home of two passionate foodies, Beto and Jorge. They teach visitors to make traditional Mexican dishes like cochinita pibil, tamales and guacamole with chapulines (grasshoppers). I loved the class, which began with a market tour around the Mercado Medellín in the Roma neighborhood of Mexico City. There, we visited Jorge’s favorite stalls, sampled some coffee, ice cream and cheeses, and bought all our ingredients for the class. Then we headed home to Casa Jacaranda, where we learned all the techniques for making delicious Mexican food! We tried some mezcal cocktails and Mexican wine and then got to eat everything we had made — from a beautiful terrace surrounded by Jacaranda trees. 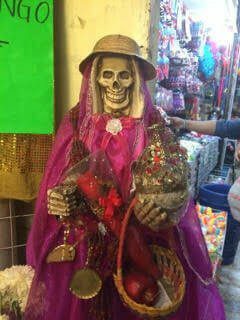 A visit at the Mercado Sonora — an infamous witchcraft market — likely isn’t on the standard list of tourist attractions in Mexico City. But it was, nonetheless, an interesting experience. The market is located in the historical center of Mexico City. I reached it pretty easily by the Zocalo on foot, but some did warn me about walking off randomly through some of the neighborhoods around the market. So, you might want to take an Uber instead. As you should in every busy market, take care of your belongings and your pockets. At first glance, the busy and crowded market was a lot like other Latin-American markets I’ve found in the area. However, when I looked closer, I realized some of the items sold at Mercado Sonora were definitely unique and couldn’t be found elsewhere. Skulls, skeletons, stuffed animals, medicine, even little bottles of liquid promising magical power, virility and eternal love. I can’t think of a single thing you can’t find here. Unfortunately, I was rather shocked by the area with living animals caged in tiny spaces. The animals were kept in horrible conditions, stacked over one another, and some even seemed lifeless. This part was certainly illegal, since I was threatened when I tried to take a picture of it. As you can see, the Mercado Sonora is definitely a unique experience. If you’re looking for an adventurous and non-touristic thing to do in Mexico City, make sure to visit! Churros and hot chocolate. Once you try it, you can die happy, I promise. I mean, do we really need anything else in life? The sweet, sticky, crispy and cinnamony sticks are what dessert dreams (or maybe even dinner dreams) are made of. And, as if you needed more sugar, washing all that down with El Moro’s sweet and rich hot chocolate couldn’t be more of a match made in diabetic heaven. If you’re brave, you’ll dunk your churro in the hot chocolate. My boyfriend and I mistakenly ordered a churro and hot chocolate set each…right after a full lunch. Even the most gluttonous would have struggled to finish, but I’m still ashamed to say we left two of our eight churros on our plate. 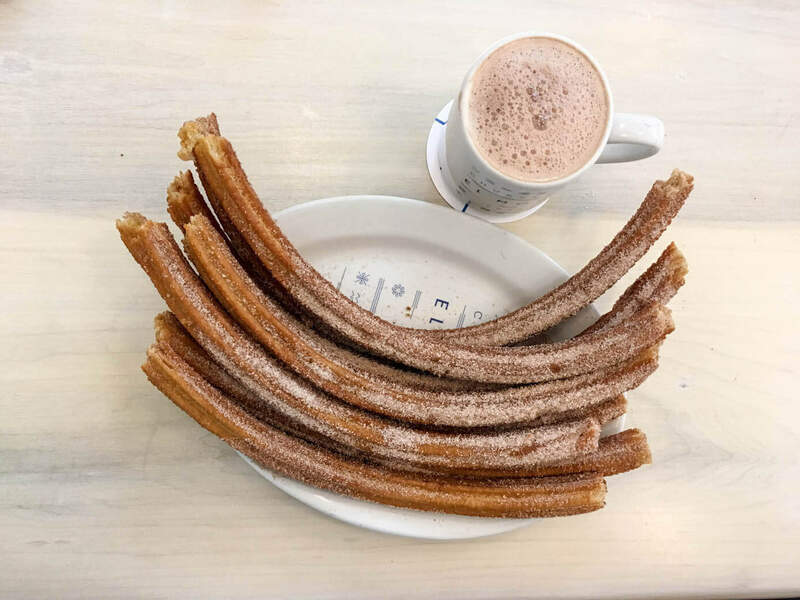 If you do nothing else while in Mexico City, I can tell you, sitting around people watching, eating churros and sipping hot chocolate is a totally legit way to spend your time while visiting Mexico City. El Moro is known as the hottest spot to chow down, but as long as you find a spot that has some fresh churros coming out, you should be good! 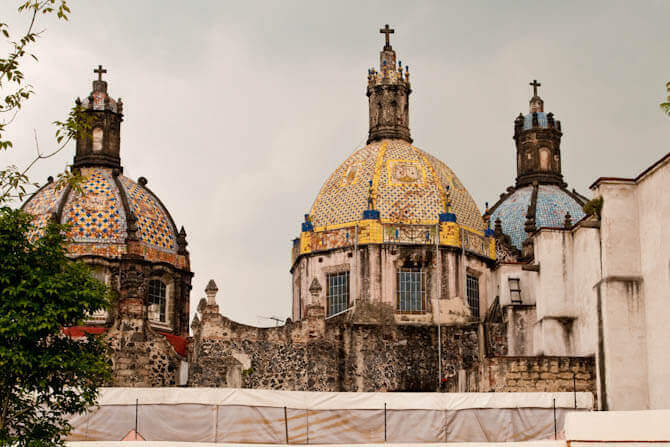 Looking to learn about Mexico’s past and present culture while visiting Mexico City? 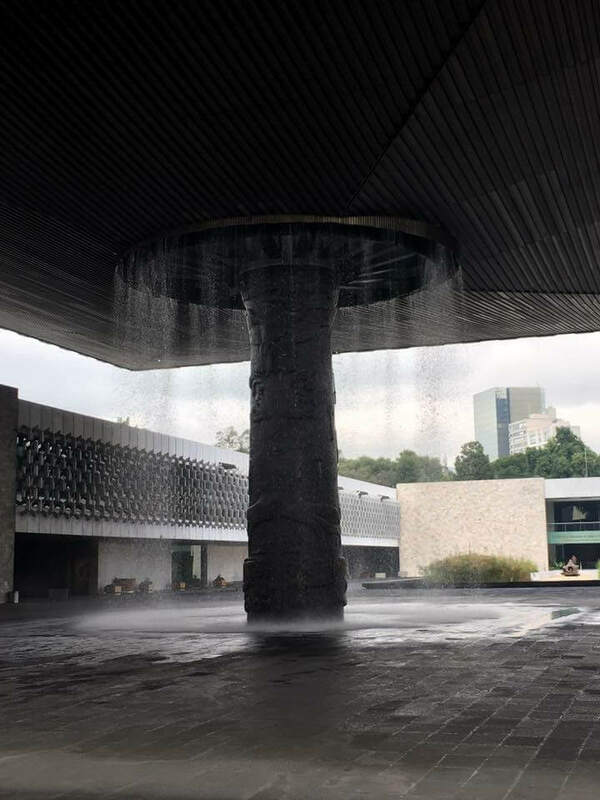 Mexico’s National Museum of Anthropology is a great place to start. The museum consists of two floors. The first is dedicated to the archaeology of Mesoamerican cultures and the second to the ethnography of modern Mexico and its 68 distinct ethnic groups. The artifacts stored here are incredible. While, unfortunately, most descriptions are only in Spanish, I still found myself wandering around and staring in awe. Each room is dedicated to a different culture and is accompanied by a video. Many of the rooms have an outdoor section where entire buildings have been brought in for you to explore! As a guy who loves both history and museums, this museum is one of the best places I have ever visited. It should be a must-see on every list of things to do in Mexico City. 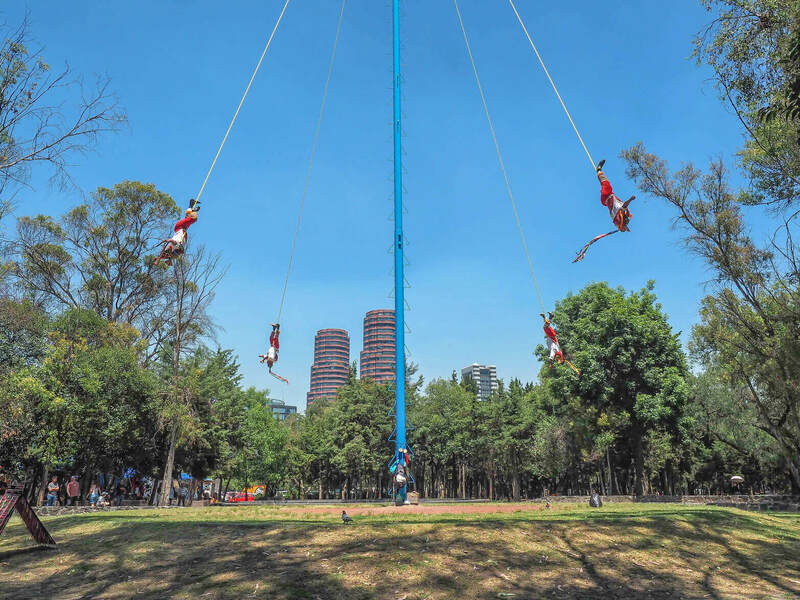 The Dance of the Voladores is a spectacle you can’t miss when visiting Mexico City. You can find it all over, including popular Mexico City attractions like the Museum of Anthropology and Teotihuacan. The “dance” is an ancient Mesoamerican ritual traditionally invoked to keep the gods happy, end drought and maintain fertility. It originated in nearby Veracruz but, over time, has spread throughout Mexico. The dance utilizes a 100-foot pole and 4 or 5 men (always men) with traditional bird-like outfits and some serious cojones. The dancers climb the pole, wrap themselves in rope, then slowly descend (upside down) back to Earth in a circular motion — all while playing flutes and banging drums. It’s an interesting, mesmerizing, and oddly relaxing spectacle to watch (especially since it’s so simultaneously terrifying). Coyoacan and San Angel were both independent villages until the mid 20th-century, when Mexico City’s expansion transformed them into urban neighborhoods. Today, they offer an easy and pleasant retreat from the busy center of the capital. Coyoacan is the quieter, less touristy of the two, with tree-lined cobblestone streets, sidewalk cafes, museums and colonial churches. I definitely recommend you take the time to visit the Frida Kahlo Museum, aka the Blue House, and the San Juan Bautista Cathedral. San Angel is picture perfect, with narrow streets lined with colorful buildings and an abundance of flowers. There is also a thriving art scene. 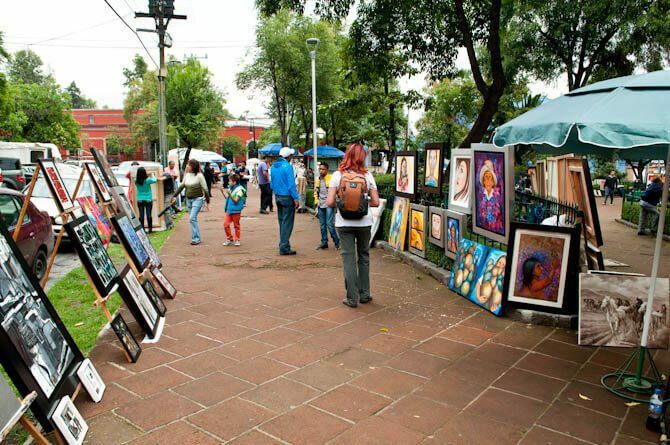 On Saturdays, the beautiful Plaza de San Jacinto turns into a vibrant art bazaar. Coyoacan and San Angel are not well served by public transit, so taxi and Uber are the best ways to get to these neighborhoods. Once there, you will find walking the best way to get around. The walk from one neighborhood to the other is beautiful and takes about an hour. If you’re visiting Mexico City and looking for a local traditional Mexican experience, be sure to visit Restaurante Arroyo. It’s the largest Mexican restaurant in Mexico and one of the largest Mexican food restaurants in the world. You can find it in the Tlalpan area of Mexico City. Restaurante Arroyo is an especially fun to visit for a celebration with family or friends. 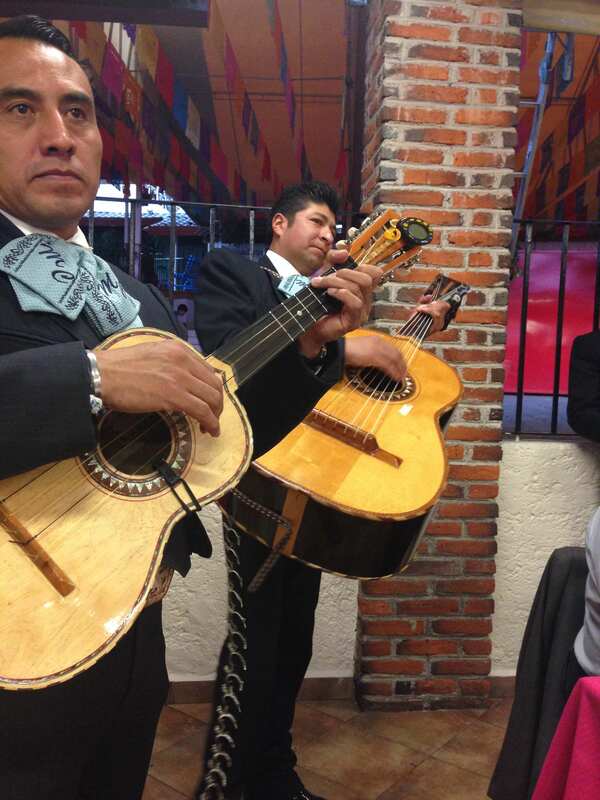 The music, joyful staff and mariachis will have you singing along as you eat the delicious food. You’ll be greeted with a large menu chalked full of Mexican food choices. 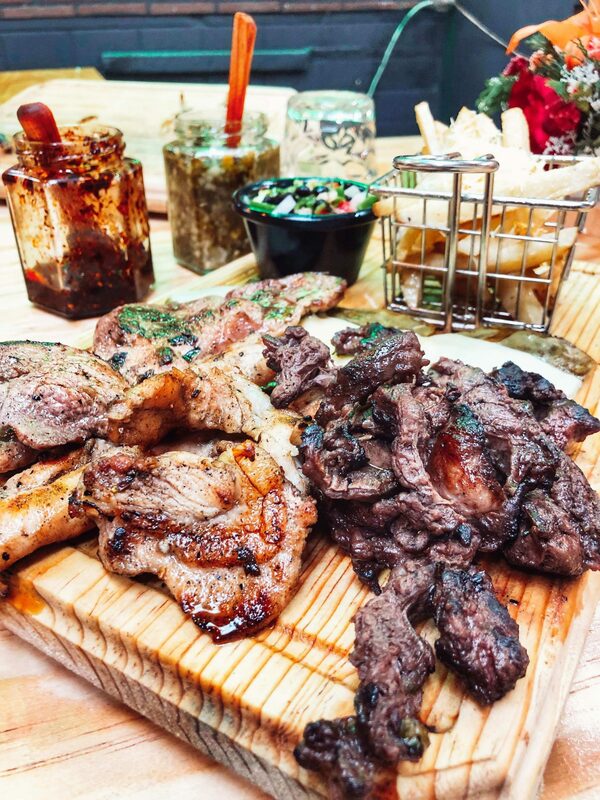 Their specialty is Barbacoa, meat slow cooked in a traditional style over a fire. The restaurant hosts different groups of entertainers from all around Mexico. Depending on what night you go, you’ll also get to experience a different flavor of musical talent. Make sure you call to reserve a table, as the place is very busy with locals all year round. 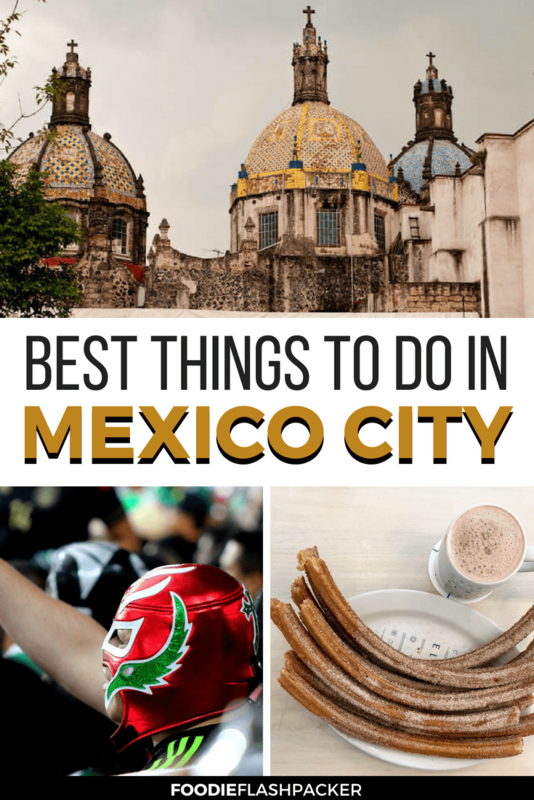 Which of these things to do in Mexico City look best to you? Let me know in the comments section below! If you enjoyed this post, please consider pinning it using the image found below. Great list! Teotihuacan looks absolutely incredible, and I really want to try pulque, haha. I’d never even heard of that before! Teotihuacan was really great! And I like the flavored pulque more than the plain version. The flavored ones were actually really nice! 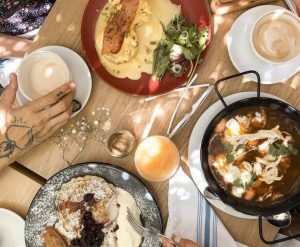 really good article with awesome spots in el D.F. My favorite spot in Mexico City is definitely the Anthropologian Museum. Have been there twice and didn’t see all sections so far. The collection of precoloumbian artifacts is really impressive and this museum belongs to the best I’ve ever seen. In general, I must say: Mexico City is the best place for museums and food. You mentioned here some really nice spots and especially Plaza Garibaldi is recommendable. I hope you also tried some Micheladas over there. I did try Michealadas but not there! I love Mexico City. I’ve given serious thought to living there. I haven’t made it to that museum yet but I need to!